This lovable pet blanket is crocheted with four 12 inch pixel squares. The pattern provides you a written pattern along with four tapestry charts to crochet the above squares. The squares are crocheted using the corner to corner method, and also includes a brief video that goes over the corner to corner technique. Use the blanket for your pets or anything else you like. As for materials, the pattern calls for a worsted weight yarn in colors shown and an I crochet hook. 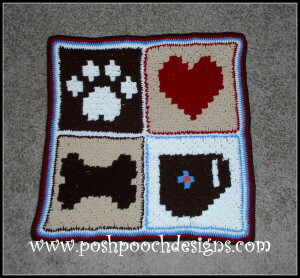 If you enjoyed this free crochet pattern you might also enjoy more designs by Posh Pooch Designs.